Color My Moods Adult Coloring Books and Journals presents HEALTHY HUE, A Coloring Health & Fitness Journal with Positive Affirmations, a motivational tool for health and wellness, weight loss, stress relief, management of diabetes, multiple sclerosis, fibromyalgia, allergies, cancer, chronic pain, migraine, anxiety, and other illnesses, using coloring. Coloring has been known to have therapeutic effects and health benefits. Journaling and coloring are two of the most relaxing activities for stress relief and meditation. Combined with the functionality of tracking your vitals, nutrition, exercise, diet, medicine, and other health information, HEALTHY HUE is an ideal tool to a healthy and fit life with the help of coloring. HEALTHY HUE combines beautiful, original artwork with positive affirmations to keep you motivated in your health and wellness journey. Full-size pages showing simple and intricate versions of each design are combined with college-ruled journaling pages for a total of seventy-two coloring pages to help track your health. Each page has something special to color. 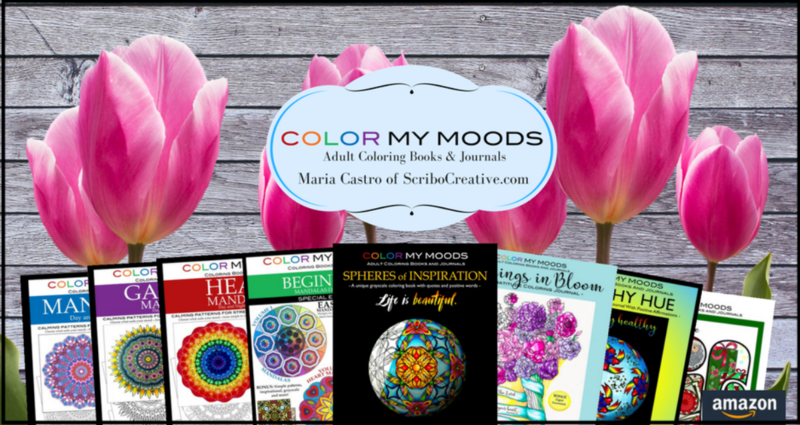 Designs suit your coloring mood on any given day — simple designs when you just want to relax, or intricate designs to focus on and keep your mind off pain on some days. The Table of Contents describe each section. You may want to visit some every day, like the Food Tracker, Sleep Tracker, Water Intake, and Activity Tracker journaling pages. 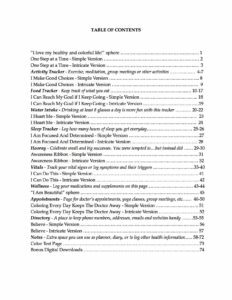 There are some that you’ll use as the need arises, like Vitals, Hooray, Appointment, and Directory. There are also Notes pages you can use as diary, planner, or for other health and fitness information. Single-sided coloring and journaling pages make it suitable for different media, including colored pencils, markers, gel pens, pastels, crayons, and more. We recommend using the extra blank sheets provided as blotter pages to minimize bleed through. Post your colored pages on social media with #scribocreative #colormymoods #healthyhue and you might just get a surprise from us. To connect with us, visit: https://www.scribocreative.com/about/. If you love HEALTHY HUE, check out our other coloring journals and coloring books on Amazon and other fine online retailers: https://www.scribocreative.com/products/. For more coloring inspiration, freebies, and exclusive discounts, subscribe to our enews: https://www.scribocreative.com/enews/. Previous Previous post: Join Our 1st Birthday Party!